Season's greetings from your furry best friend! 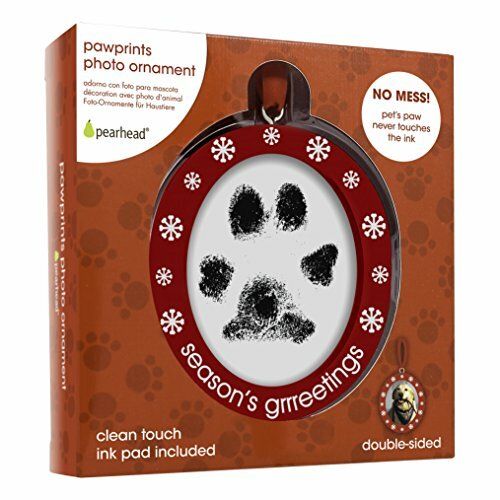 Pearhead's paw prints double-sided photo ornament with clean-touch ink pad is a festive way for your pup to celebrate the holidays. This double-sided ornament holds a 2.5 x 3-inch photo of your pet on the front and displays your pet’s paw print on the back side. Includes one clean-touch ink pad. Your pup's paw will never touch the ink! snowflakes festively cover the entire ornament and "Season's Grrreetings" is white screen printed on one side. Have a friendly seasons greetings from all of us at Pearhead! At Pearhead, we aim to create genuine, quality products to celebrate your special moments in life. We are a family of designers, marketers, and trendsetters bringing products to life that will bring a smile to your face. From concept and design to production and customer service, the Pearhead team works together seamlessly every step of the way. Whether your baby is celebrating their first year of life, you are announcing your pregnancy, or your pup is celebrating his first holiday season, Pearhead is here to share your moments in style.